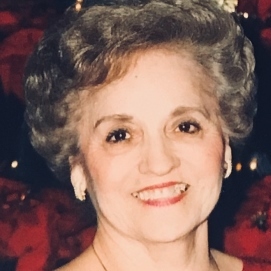 Angela C. Cisneros, lifelong resident of Corpus Christi, passed in peace on September 6, 2018 surrounded by her family and only daughter. Angela was born in Corpus Christi, TX on July 27, 1928 to Mike and Pat Chapa. She was one of seven children. Angela was the mother of Nora Molohon (Husband, Richard Molohon). Devoted grandmother of Jayme Pack (Husband, Robert Pack) and Jessi Molohon. Great-grandmother of Carter Pack. In October of 1948, she had a chance meeting with Jesse Cisneros at Carpenter’s Dance Hall in Corpus Christi, TX. Jesse would often recall the moment he first saw her in a mesmerizing black dress and immediately asked her to dance to the music of the Galvan combo. A few days later, Jesse saw her again while she was buying film for her camera and he knew he wanted to spend the rest of his life with her. Jesse and Angela were truly inseparable from that moment on. Their whirlwind romance lead Jesse to ask for her hand in marriage just two weeks later. Jesse and Angela Cisneros were married for 70 years. While our hearts ache with sadness on Earth, Angela’s reunion with Jesse in the afterlife provides great comfort knowing they are reunited forever in Heaven. A woman of faith and the heart of her family, Angela helped shaped those around her with her tireless examples of style and beauty. Angela Cisneros loved stories, playing card games, and was well known at her favorite bingo hall for being the lucky winner on a number of occasions. She will be fondly remembered by family and friends as a loving mother, grandmother, and great-grandmother. Visitation will be held from 5PM to 9PM on Tuesday, September 11, 2018 at Seaside Funeral Home Chapel and a Rosary will be recited at 7PM that same evening. A Funeral Service will be held at 1PM on Wednesday, September 12, 2018 at Seaside Funeral Home Chapel. Interment will follow at Seaside Memorial Park.